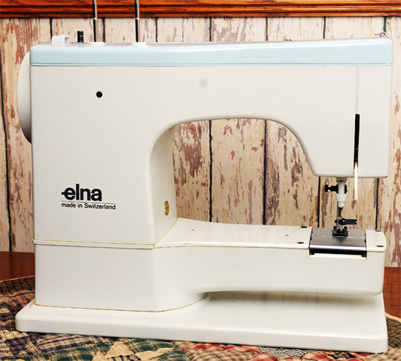 This SU is our favorite Elna--for the simple reason that it uses a foot control rather than a knee control. 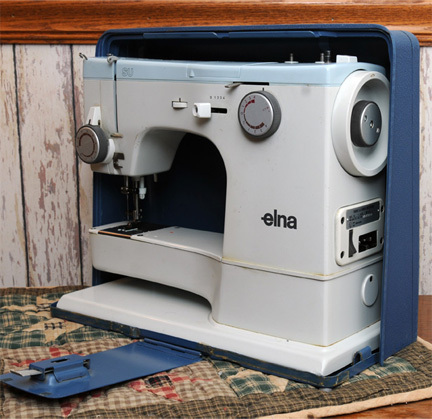 We were fortunate to find this blue carrying case on eBay shortly after purchasing our Elna SU in a local thrift store. The machine didn't work when we bought it, but we traced the problem to a loose component in the foot control. 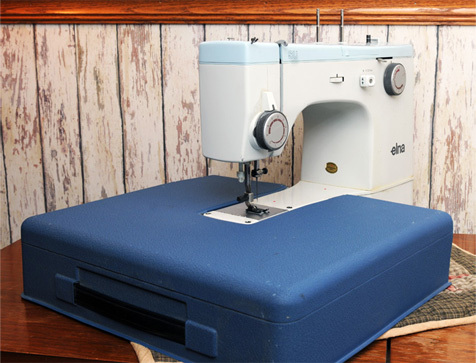 The carrying case half is used to extend the size of the machine's bed. However, we find that the surface of the case is painted using a crinkle finish which doesn't allow fabric to slide about easily as it does on an enameled finish. Also, the case moves the needle too far away from the operator to be easily seen. We boast about the fact that Singer's slant needle actually brings the needle closer so why would we appreciate anything about this setup? We don't! Also, note that the work surface is considerably higher than most other machines. The beauty of the SU is it uses a belt drive instead to a rubber drive wheel which will take a permanent set if the hand wheel is not rotated frequently. When the Supermatic drive takes a set, it will emit unpleasant vibration and noise. The SU can be idled for a considerable time without this common Supermatic complaint. We didn't get discs with this machine but found that our discs for our Supermatics work fine. 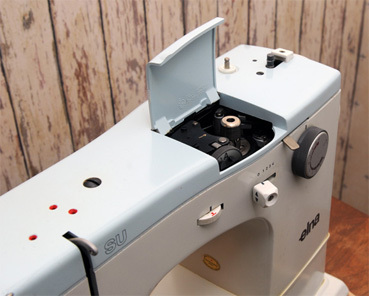 The stitch width selector must be moved to the zero position to install the discs. 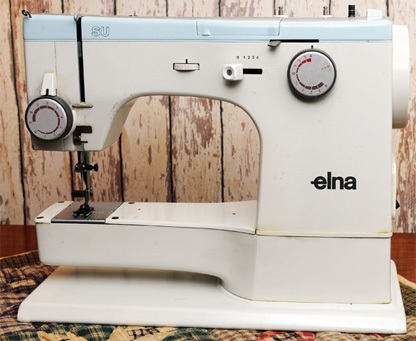 The Elna SU can use either a single or double disc. A single disc moves the needle left and right in a zig-zag pattern and the disc lobes determines the distance of travel. Double discs can cause the needle to sew forward and reverse as well as zig-zag. The image above shows--on the right-hand side--pattern formed by a single disc. The three patterns on the left-hand side were made using double discs where it can be seen that the needle moved both forward and backward. 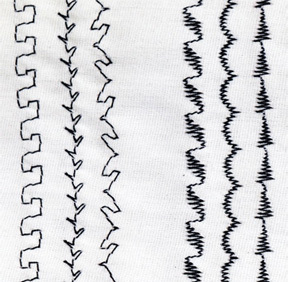 We produced these patterns using our Elna SU in an effort to demonstrate the differences.